Meet Walker. Several years ago Walker was rescued from the Fredericksburg City Animal Shelter. Back then he was a “John Doe Dog” in the pound, perhaps lost or even abandoned but certainly with no home or family to claim him. He had no collar, no identifying marks and no pet id chip where an owner could be traced. He was “persona no grata” and in a desperate situation. Thankfully, fate smiled on Walker. 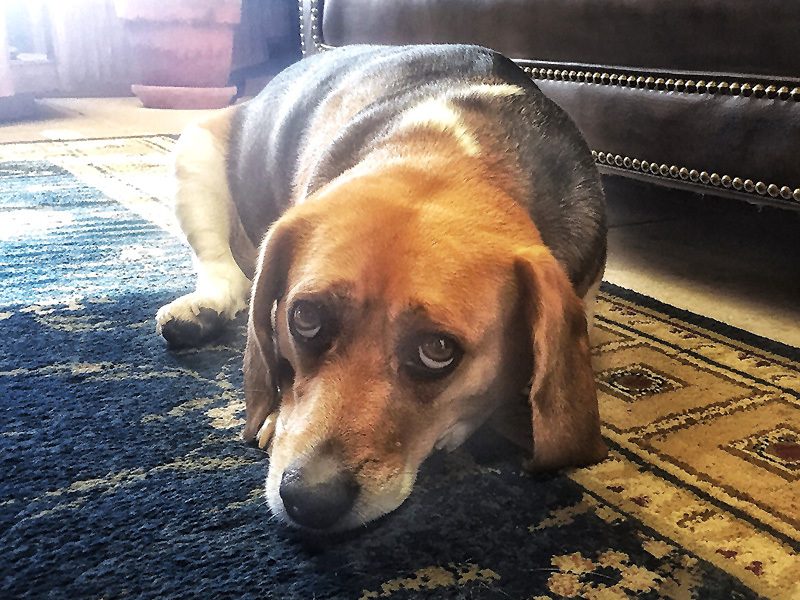 He was eventually adopted by a caring family who just happened to visit the shelter and see this lovable beagle. That was many years ago. Today a very grateful Walker has the dubious job of office mascot in a busy 10 person office here in Fredericksburg Texas. Working Walker keeps himself busy all day greeting customers and hanging out with the office staff. Pet Walker spends nighttimes and weekends with the business owner. We first met Walker while visiting the office on a business errand. But we quickly realized that he also has the honor of being the office psychotherapist. When someone is stressed or just a bit blue it’s Walker to the rescue with his big sad eyes and gentle nature! He’s a healer, comforter, and friend to everyone in need. Just like a doctor making rounds, Walker visits every worker in the office. All through the day, on a rotating basis, Walker faithfully makes rounds to check on his friends to say hello, perhaps collect a treat, then take a quick nap (oh, we did fail to mention that Walker a bed under every desk)? Then it is on to the next patient. Are you lonely? Chances are you can find your own “Walker” at the Fredericksburg City Animal Shelter. Contact: Yvonne Gerhardt (Shelter Manager). See Facebook: https://www.facebook.com/City-Of-Fredericksburg-Animal-ControlShelter-Texas-830-997-1907 for current animals.